The Latin Recording Academy® today announced six-time Latin GRAMMY® and four-time GRAMMY® winning rock-pop band Maná will be honored as the 2018 Latin Recording Academy Person of the Year™ for their extraordinary creative accomplishments and philanthropic contributions to the Latin community, as well as for their steadfast and dedicated support of environmental preservation and protection, as well as human rights. This award carries additional prestige and significance as it will be the first time a band receives the Person of the Year recognition. The Person of the Year award is bestowed upon musicians of Ibero-American heritage in recognition of their artistic achievement in the Latin music industry and their profound humanitarian efforts. Past honorees include Marc Anthony, Miguel Bosé, Roberto Carlos, Plácido Domingo, Emilio Estefan, Gloria Estefan, Vicente Fernández, Juan Gabriel, Gilberto Gil, Juan Luis Guerra, Julio Iglesias, José José, Ricky Martin, Carlos Santana, Alejandro Sanz, Joan Manuel Serrat, Shakira and Caetano Veloso. "Maná (Fher, Alex, Sergio and Juan) is an iconic band with a profound social and environmental consciousness that has created captivating and vibrant music for over three decades," said Gabriel Abaroa Jr., President/CEO of The Latin Recording Academy. "Fusing mainly funk, reggae, ska, bolero, and a spectrum of Latin rhythms mixed with pure rock; Maná has created true musical anthems. In addition to becoming worldwide Latin music icons, their members have championed for social justice, global equality, and encouraged environmental protection using the force of their melodies and lyrics, which repeatedly remind our communities of our strength, resilience, and our inherent cultural value." "It is a grand and unexpected recognition to an extensive career, a beautiful and passionate one that we continue to enjoy as if it were the first day. We are flattered that the most prestigious Latin music organization is recognizing us. Undoubtedly, it will be moving to hear our songs performed by talented colleagues and friends. We hope to continue using our voices and this honor to raise awareness about environmental concerns and human rights issues around the world," said Fher on behalf of the band. Maná will be honored and celebrated at a star-studded gala featuring a glamorous tribute concert, including renditions of their renowned repertoire performed by an impressive array of notable artists and friends on Wednesday, Nov. 14, 2018, at the Mandalay Bay Events Center in Las Vegas. 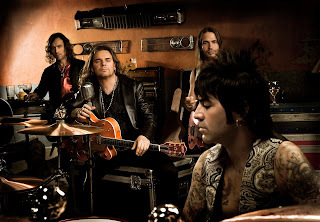 One of the world's most influential Latin rock-pop bands, Maná—currently comprised of Fher Olvera, Alex González, Sergio Vallín, and Juan Calleros—have 133 gold records, 256 platinum records, and more than 48 No. 1 hits worldwide. Classics such as "No Ha Parado De Llover," "Rayando el Sol", "De Pies A Cabeza," "Labios Compartidos," "Bendita Tu Luz," and "Mi Verdad," among many others, have become essential songs of the Latin American soundtrack. With their latest tour in the United States, the "Latino Power Tour"— they traveled to various cities promoting the importance of the Latin vote in the past presidential elections. Throughout the last three decades, they have used their voice and international recognition to raise awareness about environmental, social, political and human rights issues worldwide. In 1996, Maná created the Fundación Ecológica Selva Negra, the band's philanthropic entity, which preserves endangered species, provides educational programs on the environment, and contributes and organizes community development projects. Their success has crossed borders, they have surmounted every obstacle, and achieved a global presence where people from all over the world, whether in Israel or New York, sing their songs in Spanish, generating an emotional connection despite language barriers. The net proceeds from the gala will go toward the charitable work of the Latin GRAMMY Cultural Foundation® whose mission is to further international awareness and appreciation of the significant contributions of Latin music and its makers to the world's culture through scholarships, fellowships, grants, and educational programs. The Foundation's primary charitable focus is to provide scholarships to students interested in Latin music with financial need, as well as grants to scholars and organizations worldwide for research and preservation of diverse Latin music genres. Nine-time Latin GRAMMY and three-time GRAMMY winner Rafa Sardina will be the executive producer of the prestigious event. Greg Fera will serve as the producer, and Gustavo Borner, who has received eleven Latin GRAMMYs™ and five GRAMMYs will be in charge of the sound for the night. The musical production and coordination of the event will be managed by Moon Moosic, Inc.